Determining impact: Why do vaccine schedules differ and what is the effect of vaccination compared with better hygiene? This article was first published in July 2015; last revised in October 2018. Vaccines have greatly reduced the prevalence of diseases and they continue to be important for global health today. This entry explains how vaccines work, which vaccines are available and who in the world is protected by them. We also discuss the consequences of the worldwide rollout of vaccination programs – including the eradication of diseases. The basic mechanism by which vaccines work is simple: Vaccines create immunity in an individual by introducing a weakened or killed form of the pathogen that make us ill – such as bacteria or viruses – or its toxins or one of its surface proteins. The vaccine induces acquired immunity so that when your body encounters the real disease-causing agent it is ready to mount a defense. In Japan people were even more pessimistic and thought that only 18% were vaccinated. As it is often the case in questions on global development we again see that people in poorer countries have a more accurate view of the world: in Kenya and Senegal people thought that vaccines reach around two thirds of all children in the world, but even these highest estimates are 20 percentage points too low. Shown on the right in the same graphic is how outdated these answers are. Most estimate that the global vaccination coverage today is as low as it was in the 1980s or even earlier. People&apos;s worldview is outdated by more than three decades. 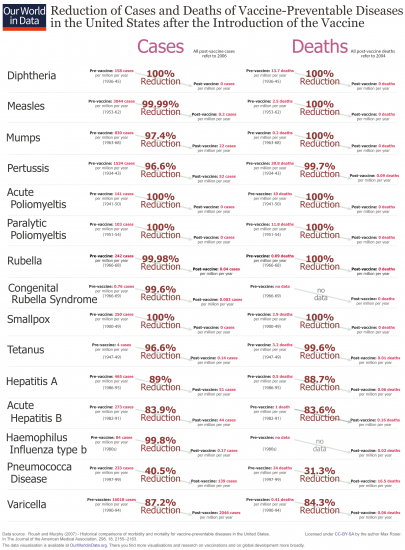 The World Health Organization recommends routine vaccinations to prevent illness, death and disability from diseases including diphtheria, pertussis (whooping cough), tetanus, polio, measles, and hepatitis B.3,4 We have created a chart that shows the absolute number of one-year-olds who have received the vaccinations. Where the biggest gap in vaccination lies is with all children being fully vaccinated and protected as much as possible from infectious diseases. Gavi, the Vaccine Alliance, has analysis that suggests only 7% of infants in the 73 poorest countries are fully immunized (that is, receiving all doses of all recommended vaccines). There is a technical difference between vaccination and immunization, as the National Health Service (NHS) explains: “Vaccination means having a vaccine – that is actually getting the injection, or nasal spray or oral vaccine. Immunization means both receiving a vaccine and then becoming immune to a disease”. The distinction is made because in a very small number of those who are vaccinated the vaccination will not ‘take’ and therefore that vaccinated person will not be immunized (i.e. will not be immune to the disease). However, as this refers to a very small number of people both terms are often used interchangeably across the academic literature and in media reporting and we follow this convention in this entry. Vaccination has a long history. An early form of vaccination was referred to as &apos;variolation&apos; or more broadly as &apos;inoculation&apos;. Practised for a long time in Asia, this was an ancient technique of deliberate smallpox infection in which dried smallpox scabs were blown up the nose to infect the person with a form of the disease which was often milder. By the 1700s variolation had spread to Africa, India and the Ottoman Empire, followed by the UK and America, where the method of infection more frequently used was a puncture to the skin. Variolation did work, but there were large risks. Those variolated could contract the more severe form of smallpox and die, and they could also transmit the disease to others. In 1796 English physician Edward Jenner demonstrated another method of inoculation in which he relied on cowpox. Cowpox is a similar disease to smallpox and it had previously been observed that an infection with cowpox can protect against smallpox. Jenner conducted an experiment using matter from a cowpox lesion to inoculate his gardener’s eight-year-old son James Phipps. Two months later Jenner exposed the boy to smallpox lesion matter and when Phipps did not develop smallpox he concluded that he was protected against the disease. Jenner called the procedure ‘vaccination’ after &apos;vacca&apos; the Latin word for cow because of the origin of this first vaccination from the cowpox virus. Following the findings of Jenner as the first scientific attempt to control disease by vaccination, the smallpox vaccine went through many iterations, with the newer vaccines produced by modern cell culture techniques (passing the virus through cell culture makes the vaccine safer). By the middle of the 20th century confidence grew that smallpox could be the first disease that humankind might be able to eradicate. In 1967 the WHO launched a global eradication of smallpox program. Mass vaccination of over 80% of a country&apos;s population ensued but people who were nomadic or lived in politically unstable regions posed particular problems. A number of innovations came in the development of foot-powered injector called the “ped-o-jet” and then the bifurcated needle, which was efficient and cost-effective to use. In order to reach large sections of population, epidemiologist William Foege developed Eradication Escalation (E2) to contain smallpox outbreaks during October (the seasonal low point of smallpox transmission where prevention of just few cases could stop a smallpox chain transmission). Other obstacles faced included forcibly vaccinating an Indian religious leader to convince his followers to be vaccinated, negotiation of ceasefires for vaccine transport in war-torn Nigeria, vaccinating in concentric rings around an outbreak, and cash bounties to reward the reporting of smallpox cases. Finally in 1977 the last case of naturally contracted smallpox was reported in Somalia, in Ali Maow Maalin, and in 1980 the WHO announced that smallpox had been eradicated. We cover the history of smallpox, including the vaccination and eradication, in more detail in our entry on smallpox. Eradication is the ultimate goal of vaccination against a disease and on Our World in Data we have an entry dedicated to the eradication of diseases. The chart below shows a timeline of innovation in the development of vaccines. Each bar begins in the year in which the pathogenic agent was first linked to the disease and the bar ends in the year in which a vaccination against that pathogen was licensed in the US. For some diseases there has been a relatively short timespan between when the infectious agent was linked to the disease and when a vaccine was developed. The quickest was 10 years for measles. The agent was linked to the disease in 1953 and the vaccine was licensed in the U.S. in 1963. Malaria is proving harder as it has been over a century since the agent was linked to the disease. Alphonse Laveran discovered in 1880 that the Plasmodium parasite is the cause for malaria.5 Early vaccines developed in the last several decades were insufficiently effective and until recently none of the scientific efforts led to a licensed vaccine. Recently there has been new hope for a malaria vaccine as we document in the relevant section in our entry on malaria. Bacterial culture techniques which allowed the development of bacterial vaccines for diphtheria, tetanus, and pertussis in the early 1900s. The first and second world wars prompted combined efforts by universities, governments, and private companies. By the 1950s viral tissue culture techniques allowed the development of vaccines against polio, measles, mumps, rubella, and varicella (chickenpox). New technologies in molecular biology and advanced chemistry techniques have most recently led to vaccines against hepatitis B, influenza, and pneumococcus, which causes pneumonia and meningococus, which causes meningitis and septicaemia. The most common and serious vaccine-preventable diseases tracked by the World Health Organization (WHO) are listed below. We grouped them when a combination vaccine is commonly given for several diseases and in brackets behind the name of the disease you find the abbreviation for the vaccine. Diphtheria, tetanus, and pertussis (DTP) are all bacterial diseases and a combination vaccine against all three diseases is commonly used. Diphtheria primarily infects the throat and upper airways and is fatal in 5 – 10% of cases. Tetanus is not passed person-to-person but through spores of a bacteria living in soil and animal intestinal tracts. These bacteria enter the body through wounds and release a toxin that affects the nerves, which causes muscle stiffness and spasms. Pertussis is a highly contagious disease of the respiratory tract, commonly known as whooping cough. Children who contract pertussis tend to have coughing spells that last four to eight weeks, but the highest fatality is in young infants. Vaccinating health workers and pregnant women is the most effective strategy for preventing disease in infants too young to be vaccinated. Haemophilus influenzae type b (Hib) is a bacterial infection that causes meningitis and pneumonia transmitted through the respiratory tract from infected to susceptible individuals. Hepatitis B (HepB) is a highly contagious viral infection that attacks the liver and is transmitted through contact with the blood or other body fluids of an infected person. As the chart below shows, it is estimated that about 100,000 people die each year of chronic liver disease due to hepatitis B. The WHO recommends that all infants should receive their first dose of vaccine as soon as possible after birth, preferably within 24 hours. Poliomyelitis (OPV, IPV) is a highly infectious viral disease. Once the poliovirus invades the nervous system it can cause irreversible paralysis in a matter of hours. No cure exists for polio, only treatment to alleviate symptoms. As we detail in our entry on polio the world is on its way to eradicate the disease thanks to the vaccine against the virus: While in the 1980s there were 350,000 paralytic cases of polio every year, the world saw only 42 cases in 2016. Measles, mumps, and rubella (MMR) are all viral diseases. Mumps infection occurs via direct human contact or by airborne droplets. It causes painful swelling at the side of the face under the ears (the parotid glands), fever, headache and muscle aches. It can cause sterility in teenagers and adults. Rubella is usually mild in children but up to 90% of infections just before or in the beginning of pregnancy can result in complications and in approximately 20% of those cases result in fetal death. Meningococcal meningitis (Men) is a bacterial disease which can cause severe brain damage and is often deadly. Transmitted through contact with respiratory droplets or secretions, it kills more than 120,000 people every year. Tuberculosis (BCG) is a bacterial disease transmitted by people infected with pulmonary (lung) TB. The Bacille Calmette-Guerin (BCG) vaccination is only partially effective providing some protection against non-pulmonary TB (such as TB meningitis) in children but is unreliable against adult pulmonary TB. Every year, 1.2 million people die because of TB (see the chart below). Yellow fever (YF) is a viral disease transmitted by infected mosquitoes. There are 42 countries and territories at risk for yellow fever in Africa and the Americas. In these 42 countries and territories, vaccine coverage is estimated at 45%. The WHO has a larger list of 26 diseases for which vaccines are available (including Japanese encephalitis, pneumococcal disease, varicella/chicken pox, HPV, Hepatitis A and rotavirus). Additionally, there are currently many vaccines in the pipeline of development. 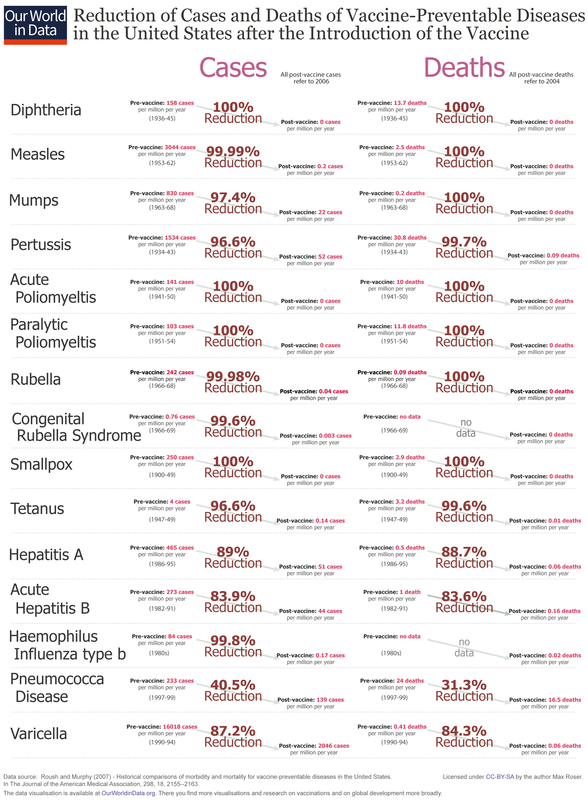 The visualization below shows the reduction in cases and deaths from vaccine-preventable diseases in the United States after the introduction of each vaccine. This data was published by Roush and Murphy (2007)8 and the data can be viewed in a table here. For several diseases the US has achieved a 100% reduction of cases and deaths and for many other diseases the reduction is often very substantial as well. 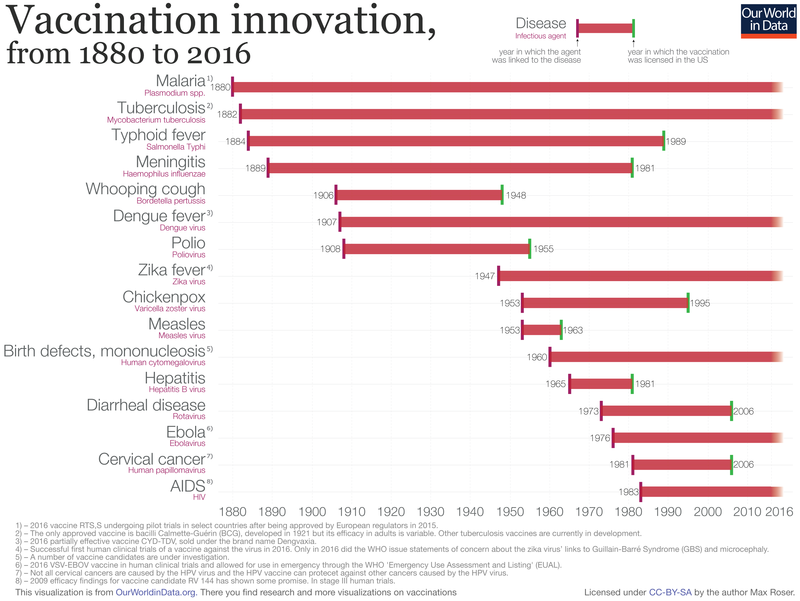 The introduction of a vaccine was not the only reason for progress against these diseases as the visualization below shows. The case-fatality rates of measles was falling in high income countries such as the US prior to the introduction of the vaccine in 1960 – this is best seen by switching from the linear to the logarithmic axis. Improved living conditions, nutrition, and medical advancements meant that contracting measles was less and less likely to be fatal. A visualization showing the total number of cases and deaths can be seen here. Supply constraints have caused problems for country access to vaccination. One-third of 194 countries have run out of a vaccine for a month or longer – according to data submitted to WHO and UNICEF – and this includes both high- and low-income countries. In the US, the Centers for Disease Control and Prevention (CDC) stated that reasons for shortages were multi-factoral and included "...companies leaving the vaccine market, manufacturing or production problems, and insufficient stockpiles". In 2018, it was reported that shortages where supplies of vaccines were critically low included those that target yellow fever, hepatitis B, cholera, meningitis C, diphtheria, whooping cough, tetanus, hepatitis A, and tuberculosis. Concerns about the supply of vaccines in an epidemic or pandemic have been raised. For example, the supply of yellow fever vaccine was limited for the outbreak in Angola in 2016 leading to the recommendation of a fractional dose to extend existing supplies.11 Laurie Garrett argues that because the drug had become so cheap (60 cents for each vaccine 2008) few companies had an incentive to produce it and world stocks of the vaccine were nearing zero, forcing the WHO to dilute donated vaccines from countries like Brazil (which sent 18 million doses) by 5 to 1 with the hope they would still be sufficiently effective. Romania experienced a situation of parallel vaccine exports in 2016 where more vaccines were exported than was supplied to meet the country&apos;s needs. A shortage of the measles, mumps, and rubella (MMR) vaccine was partly responsible for the measles outbreak in 2016-17.12 In Venezuela, a country experiencing an economic crisis, there are severe shortages of medicines, including vaccines, which has led to an estimated one million unvaccinated children and the re-emergence of diseases such as diphtheria and measles. In the past vaccines were often viewed as less profitable products for pharmaceutical companies, which led to a lack of investment and some companies pulling out of production altogether.17 But this has changed as the revenue of the global vaccines market has increased and richer country governments and insurance companies have been willing to pay more for new vaccines. In addition, growing economies such as India and China are investing more in vaccines as well as developing their domestic manufacturing capacity. Poorer countries now have Gavi to help governments pool resources and make advance purchase commitments.18 Gavi is an international organisation created in 2000 to bring together public and private sectors, with the goal of equal access to new and underused vaccines for children in poorer countries. Now emerging economies are also able to produce more of their own vaccines. Nevertheless, vaccines make up only a small proportion of about 2.4% ($24 billion) of the global pharmaceutical market, worth over $1 trillion a year. Vaccines are often subsidized. In addition to co-financing support for the vaccines themselves, Gavi offers vaccine introduction grants, which for example cover US$0.80 per infant or $100,000 lump sum minimum when a low income country introduces a new routine vaccination. DTaP is slightly more expensive; it is sometimes called &apos;the painless vaccine&apos; because it causes less of a local reaction and pain but should not be given to children over the age of seven. However, DTwP has been shown to be more efficacious at preventing the transmission and spread of disease to unvaccinated people and to those with weak immunity. New vaccines tend to be more expensive as they are under patent protection. For example when the HepB vaccine was developed many lower income countries could not afford to pay $30 per dose.20 Today there is often a differentiation between the prices paid by countries as shown in the small table below. We provide detail on three vaccinations: DTP, measles, and polio. These diseases (plus tuberculosis) were the original six targeted by the WHO for their Expanded Programme on Immunization (EPI) and mass vaccination coverage expanded greatly. The EPI was initiated by the WHO in 1974 to build on the success of smallpox eradication and the goal was universal immunization. The chart below shows the progress over time of DTP3 immunization coverage of children around the world. By clicking on any country you can see the change in that country over time. The WHO reports in 2017 that 85% of infants worldwide (116.5 million infants) received 3 doses of diphtheria-tetanus-pertussis vaccine (DTP3). Also in 2016 130 countries had reached at least 90% coverage with the DTP3 vaccine.22 If we look at the change over time by world region it is South Asia in particular that stands out. While 85% of one-year-olds today are immunized, that same figure was as low 6% in 1980. Within each country there can be substantial differences in vaccination coverage. The WHO reports that in all regions children in the richest 20% of urban households are more likely to get immunized than children from the poorest 20% of households. Some countries lag behind however. Ukraine stands out as having particularly low DTP vaccination rates in 2015 of 23%, falling from 98% in 1999. Ed Holt writing for the Lancet in 2013 attributed the decline to: "A combination of public mistrust in vaccinations, poor vaccine supply, and corruption in the health system".23. Therefore Ukraine is suffering from a combination of factors effecting vaccination rates from public attitudes and systemic delivery problems. Furthermore, the unrest since 2014 and Russian military intervention is likely to have worsened matters. Today only Equatorial Guinea reports even lower rates at 16%. As Human Rights Watch observes, very little of the country&apos;s wealth is being directed towards the needs of citizens. The number of under-vaccinated children in Nigeria remains high, with 3.4 million children going without the DTP3 vaccine (compared with 2.9 million in India). The world map shows the share of children vaccinated against measles. You can switch to the &apos;chart&apos; view to see the global coverage against vaccines. The measles vaccine was developed in 1963. 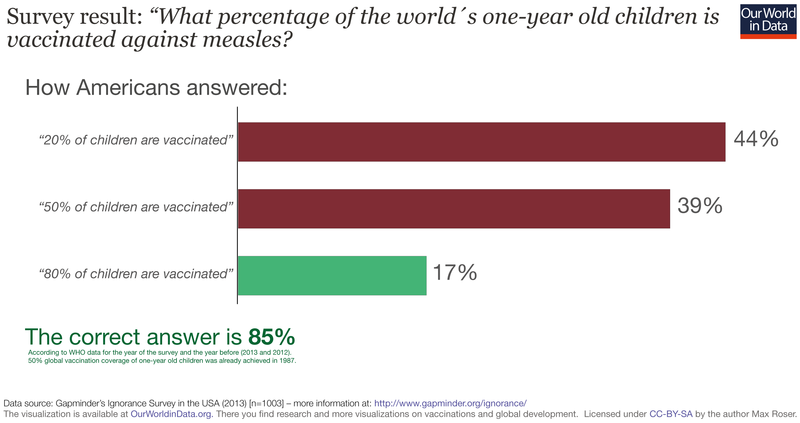 In 1983 – the first year for which global data is available – only every second child was vaccinated against measles. In the latest data this share has increased to 85% globally up from 72% in 2000.24 The sub-Saharan African region achieves the lowest measles vaccination rates, along with conflict-ridden and unstable countries (e.g. Syria, Afghanistan, and Iraq). But also some of the Pacific Islands – such as Papua New Guinea and Vanuatu – are performing poorly. As of 2017, the WHO estimate that 166 countries had included a second dose as part of routine immunization and 67% of children received two doses of measles vaccine according to national immunization schedules.26 Two doses are needed for a higher level of protection. This scatterplot compares the vaccination coverage against measles with the coverage against DTP3. The visualization below shows the discussed increase of the global vaccination coverage of one-year-olds and the simultaneous decline of reported cases of the disease; from close to 1,000 cases per million people globally to 28 cases per million. This represents a 33-fold reduction. Country by country you can see the change over time in this visualization here. One of the greatest successes that we can imagine for humanity is the complete eradication of a disease. For one disease – smallpox – this has actually been achieved. The disease was fully eradicated in 1980. For other diseases we are getting close, as we are showing in our entry on the eradication of disease. Polio is targeted for global eradication and we present the empirical evidence on this effort in an entry entirely dedicated to polio. This has become possible through the polio vaccine that was developed in 1955. The WHO estimates that in 2015, 85% of infants around the world received three doses of polio vaccine. And the number of paralytic polio cases have decreased by over 99% since the 1980s, from an estimated 350,000 to 400,000 paralytic cases per year to 22 reported cases in 2017. While the benefits might possibly be forgotten as vaccine-preventable diseases have lost their threat thanks to the introduction of the vaccines it is still true that people around the world – including those in richer countries – continue to benefit from vaccinations. You find more detail in our entry on smallpox. The low price of vaccines compared with other health interventions has made them especially attractive as a way to improve global health. Vaccines typically induce acquired immunity via an agent inside the vaccine. The agent can be made of killed or weakened forms of the microorganism, its toxins or its surface proteins. Herd immunity provides a protective barrier, especially also for those who cannot be vaccinated. These include vulnerable groups such as babies too young to be vaccinated or immune-compromised children who are the first potential victims of low vaccination rates. Australia, Canada, Germany, Qatar, Republic of Korea, Saudi Arabia, Taiwan, Uruguay, U.S., Italy (Sicily only) and Spain (Madrid only) followed afterwards and adopted universal chickenpox vaccination. When extreme cases of chickenpox have occurred there have been calls for the vaccine to become available for free through the National Health Service in the UK. However, most European countries do not vaccinate against chickenpox, except for &apos;at risk&apos; groups. The main reason for not adopting universal vaccination is the high cost. Additional supporting justifications are that it is usually a mild disease and the benefit of fewer cases of shingles – as explained here. The Centers for Disease Control and Prevention in the US ran the Varicella Active Surveillance Project (VASP) from 1995 through to 2010 to monitor the impact of the varicella vaccination program and the key finding is shown in the chart below. The coverage of the vaccine in Los Angeles County rose from 37.9% in 1997 to 95.1% in 2010, and in Philadelphia from 41.2% in 1997 to 94.6% in 2010 (one-dose vaccinations for children between 19 and 35 months of age). 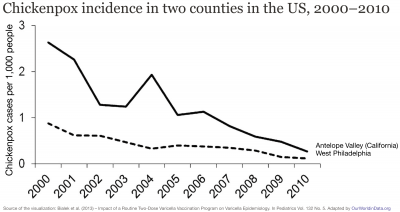 By 2010, varicella incidence declined by 98% in Antelope Valley (California) and West Philadelphia (Pennsylvania) compared with 1995. Outbreaks and hospitalizations also decreased rapidly. From 1995 to 1998, hospitalization rates ranged from 2.2 to 3.3 per 100,000 population but by 2006-2010 this had declined to 0.2 per 100,000 in Antelope Valley and 0.5 per 100,000 in Philadelphia. Chickenpox is an example that can also help to answer the question of whether better hygiene or vaccination are in fact responsible for the reduced rates of disease. Although both are important, a more recently adopted vaccination such as chickenpox can demonstrate the effects of vaccination in reducing the rate of disease after the importance of hygiene was discovered and became a preventative measure against disease. As hygiene standards already reached high levels, the additional benefit of the vaccine is confirmed. The impact on disease rates demonstrate it is not hygiene but vaccination that reduced the incidence of chickenpox so dramatically in the US. Anti-vaccination opposition is as old as mass vaccination itself. The original anti-vaccination organisation &apos;Anti-compulsory Vaccination League&apos; was established in the UK in 1866 as a protest against smallpox vaccination mandates. In the late 1880s and 1900s opposition to vaccines in the U.S was organised through the &apos;Anti-Vaccination League of America&apos; and the &apos;American Medical Liberty League&apos;.34 It is important to note however, that there are similarities and differences to opposition to vaccination across time and place. In the 19th century resistance could be attributed to concern about the safety and efficacy of vaccines, which were an unregulated industry along with a dislike for the extension of state powers. Furthermore, the opposition was mostly aimed at the one vaccine available at the time for smallpox. The world map shows that in most countries the huge majority considers vaccines to be safe. But in some countries – several former Soviet countries, France, and Japan – a substantial share of the population disagrees. In France 41% of the population does not consider vaccinations safe. In other countries the share that is of the same opinion is smaller than 10% (in Bangladesh only 0.2%). Beliefs and attitudes do not translate straightforwardly into behaviour. Even for countries where a large share of respondents had a high level of skepticism about the safety of vaccination, coverage rates may remain high. Compulsory vaccination: Many Eastern Bloc countries introduced compulsory vaccination during the communist era. Vaccination was previously compulsory in Romania for example and after a drop in vaccination rates the country is going through the process of reintroducing compulsory vaccination. The same is true for Italy and also France, which had compulsory vaccination for three diseases but increased this number to 11 in January 2018 in response to a drop in vaccination rates. Mandatory vaccination: Some countries, such as the United States, have mandates for vaccination where a child is required to be vaccinated to enter state school or daycare. An early case in the US paved the way for state jurisdiction to protect public health in light of personal liberty.41 In Jacobson v. Massachusetts (1905) the Supreme Court ruled that states have the authority to require vaccination against smallpox during a smallpox epidemic. 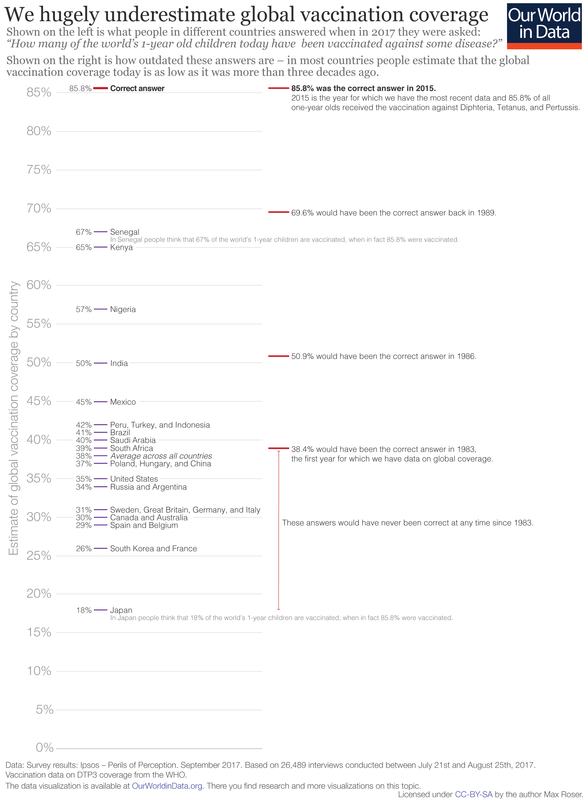 Since then the US has had a history of school vaccination requirements. The increased number of children in public schools as a result of the compulsory school attendance law led to an increased risk of smallpox outbreaks, through close contact in large crowded classrooms.42 Similarly in Australia two policies penalize parents for not vaccinating their children. The &apos;No jab no play&apos; policy removed unvaccinated children from state-sponsored childcare. The 2016 &apos;No jab no pay&apos; policy removes state welfare by not providing the universal &apos;Family Allowance&apos; welfare payments for parents who are conscientious objectors of vaccination. Vaccination requirements for country entry: For countries in Africa and South America where yellow fever is endemic or where the mosquito vector is present a certificate of proof of vaccination is required. Only then will the country issue a visa upon entry to that country to prevent importation of this disease (particularly if travellers come from, or have visited other yellow fever endemic areas).44 In past centuries (17th to 19th), yellow fever was transported to North America and Europe, causing large outbreaks that disrupted economies and development, and in some cases decimated populations. Throughout the 18th and 19th century, yellow fever was among the most feared diseases in the ports of the Old and New World. Saudi Arabia is the only country that requires the additional vaccinations of meningococcal disease and polio for pilgrims visiting Mecca. Does it work to make vaccinations compulsory? Whether compulsory vaccination results in improved vaccination rates is not a straightforward question to tackle because it is highly dependant on country context, historical circumstance, cultural and social norms, as well as the practicalities of implementing and enforcing such a law. Certainly in Eastern Bloc countries when the vaccination law was compulsory, vaccination rates have been high but it is unclear whether to attribute this to the law or the behaviours and mechanisms of compliance under communist rule. Certain vaccinations have historically been compulsory such as smallpox, polio, and yellow fever. Here vaccination rates have also been high but it also encouraged organised opposition to vaccination and public discontent. This is a major concern for public health authorities that a relationship of trust, between governments and citizens is threatened (particularly for health where a rhetoric of self-responsibility, personalisation, and choice is encouraged). There are countries with high vaccination rates without compulsory vaccination and governments do not want to disrupt public trust and self-responsibility by making vaccination compulsory, particularly if it is not seen as needed. It has been argued that high coverage has been achieved through "other approaches or efforts" and so acceptance of compulsory vaccination might be problematic in countries such as Sweden, Norway, Denmark, the Netherlands, and the UK.45 In recent years governments have acted in response to epidemics to make vaccinations compulsory, as we have seen for 2017-18 with compulsory vaccinations in France, Italy, Germany, and Romania. One country where we can see variation in vaccination policy and the effects this has is the US. In the US states decide on what exemptions are allowed for the mandate for children to receive vaccinations to access education and daycare. The reasons for such laws in the first place came with a free, public education system, which also unfortunately meant schools became sites of epidemics for childhood diseases. Exemptions are granted for medical reasons but many states also allow for philosophical, personal belief or religious exemptions. Only three states – Mississippi, West Virginia, and California – only allow for medical exemption. Californian immunization rates have increased following a new Senate Bill SB 277 in 2015 to remove non-medical exemptions to vaccination. We can see on the chart below that there is not a strong correlation between stricter requirements for vaccination (i.e. only allowing for medical exemptions). Indeed Mississippi does often top the list as having the highest vaccination rates and only medical exemptions are allowed in the state but also starkly Mississippi residents are also the consistently the unhealthiest and poorest in the entire country. Health outcomes are very poor and most cannot afford healthcare (the state has the highest percentage without health insurance in 2017) and so perhaps it is unsurprising that resident accept subsidized vaccinations that are required in any case for access to childcare and state schools (without the option for home or private schooling where vaccines are not required). Shown below is the correlation of vaccine coverage with the level of prosperity of a country. The vaccine coverage against diphtheria, pertussis (whooping cough), and tetanus is a good marker of strength in a country’s immunization programmes since several administrations are required. Rich countries generally have vaccination coverage rates of more than 90%. Countries in which a large share of the population is living in extreme poverty often – but not always – have lower immunization rates, as this chart shows. The coverage is calculated as the proportion of persons in a target age group who received a vaccine dose. Dates of vaccination are either taken from a child’s home-based record, recorded based on caregiver recall, or from health facility records. While appearing straightforward enough, several methodological problems of household survey respondent data on vaccination have been well documented.47 Questions have arisen about how accurately parents can recall child immunization history and the limitations of phone calls to collect data. In 2015 coverage estimates at the district level were only reported for 158 of the 194 WHO Member States. National data only provides part of the picture of immunization coverage. Different levels of coverage data, including at sub-national or district level is useful for gaining an understanding of where there might be clusters of under- or un-vaccinated children. Available at: Online from UNICEF here. Also available via Gapminder here (search "vaccine" to find the data). More information about vaccines in general can be found on the World Health Organization (WHO) page on immunization. This survey result is in line with the finding of the Gapminder Ignorance Project, which studied Americans's perception of global vaccination efforts. Just as in the Ipsos Mori survey, the answers that most Americans gave were far off from the truth. More information on the Gapminder 'Ignorance Test' can be found here. The results for the US are here on Gapminder's site. The survey results are from Chris Jackson (2017) – Global Perceptions of Development Progress: ‘Perils of Perceptions’ Research’, published by Ipsos MORI, 18 September 2017. Online here. The Bacille Calmette-Guerin (BCG) vaccine for tuberculosis (TB) is recommended in countries where TB is common. BCG policies and practices have varied considerably across time and countries. The BCG World Atlas is an online resource that tracks these changes comprehensively. See Francis EG Cox (2010) – History of the discovery of the malaria parasites and their vectors. In Parasites and Vectors. Online here. Additionally there is the possibility to see this change as a bar chart here. These data are taken from the research paper Roush and Murphy (2007) – Historical comparisons of morbidity and mortality for vaccine-preventable diseases in the United States. In the Journal of the American Medical Association, 298, 18, 2155–2163 here. The vaccines against the diseases up till ‘Tetanus’ were vaccines licensed or recommended before 1980. The vaccines against the last 5 diseases were only licensed or recommended between 1980 and 2005. 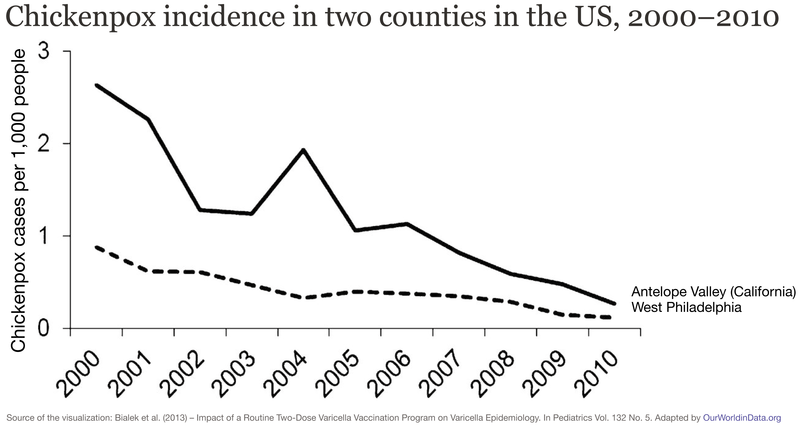 See also 'Graphical proof that vaccines work (with sources)' in Medium online here. According to MacKenzie, D. (2011) – Vaccines enjoy a healthy return. New Scientist. Available online. In 2014 their vaccine business was acquired by GlaxoSmithKline, as reported here. There are exceptions however. A vaccine for tetanus and diphtheria (td) for example, has a large number of suppliers (13, and 7 for the paediatric formulation). Review of vaccine price data. Submitted by WHO European Region Member States through the WHO/UNICEF. Joint Reporting Form for 2013. Online here. In 2014 there were 135.2 million one-year olds. Of these 84.52% received the vaccine against measles. This means that 135.2 *0.8452 = 114.27 million children were vaccinated. Gaston De Serres, Jill Sciberras, Monika Naus, Nicole Boulianne, Bernard Duval, and Louis Rochette (1999) – Protection after Two Doses of Measles Vaccine Is Independent of Interval between Doses. In The Journal of Infectious Diseases, Volume 180, Issue 1, 1 July 1999, Pages 187–190, https://doi.org/10.1086/314847 Online here: https://academic.oup.com/jid/article/180/1/187/990623. Smallpox is the only disease that affects humans which has been eradicated through vaccination. Rinderpest, a disease that affected cattle, has also been eradicated. Polio is getting close to being eradicated. See Oxford's Vaccine Knowledge Project for an explanation here: http://vk.ovg.ox.ac.uk/herd-immunity. This table is taken from Wikipedia's entry on Herd Immunity. Bonanni et al. 2009; Bonanni P., Breuer J., Gershon A., Gershon M., Hryniewicz W., Papaevangelou V., et al. (2009) – Varicella vaccination in Europe - taking the practical approach. BMC Med 7: 26 here. See also http://www.emro.who.int/afg/programmes/epi.html where "geographical barriers and functional challenges" are reported to impact upon outreach and coverage capacity. 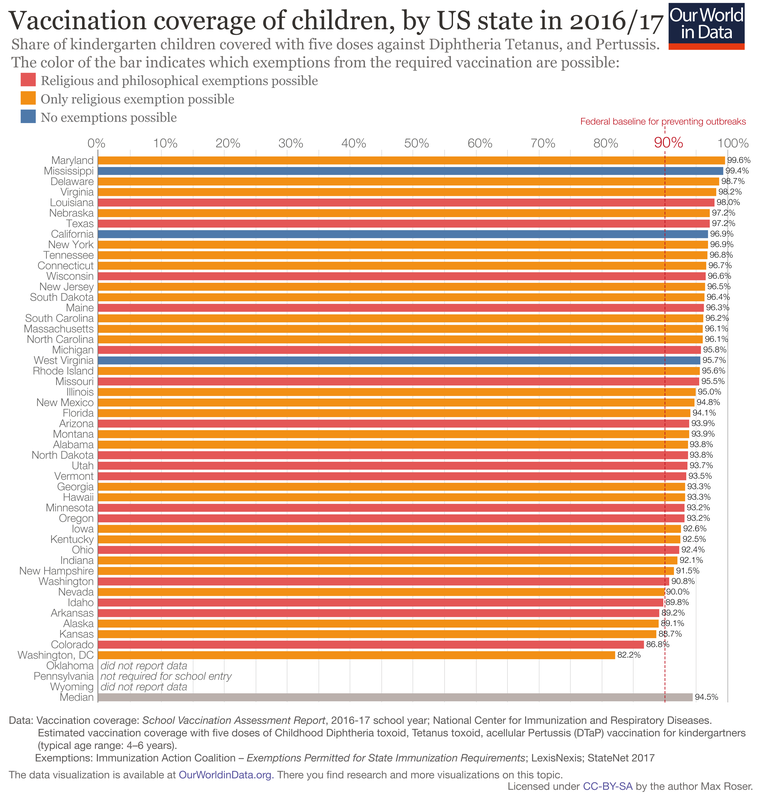 Interestingly even if respondents thought vaccination was incompatible with their religious beliefs they still thought it to be effective and important. And even if respondents thought that vaccination was effective it did not mean they also thought it to be important. The data source for vaccination coverage: School Vaccination Assessment Report, 2016-17 school year. Estimated vaccination coverage with 5 doses of Childhood Diphtheria toxoid, Tetanus toxoid, acellular Pertussis (DTaP) vaccination for kindergartners (typical age range is 4–6 years). Regarding the school vaccination coverage and exemption methods the source notes: "Each school year, school nurses, other school personnel, or health department personnel check the vaccination and exemption status of kindergartners enrolled in public and private schools as required by state law or regulation. State and local immunization programs measure vaccination coverage among children entering kindergarten annually. This may be done for every student or for a sample of students. State and local areas set the vaccination requirements. Immunization information systems (IISs) may be used as one source of data for school vaccination assessment. The school-level data are reported to the health department. The aggregate data are reported to CDC for public and private schools. Data for home-schooled students are not routinely reported to CDC." The types of permitted exemptions vary by state. For specific details refer to School Vaccination Requirements and Exemptions. Other vaccines measured by the WHO and UNICEF are HepB3, Hib3, MCV and PAB.